(Bloomberg Opinion) --John Bogle’s biggest contribution is yet to come. That’s just a small fraction of Bogle’s impact. Roughly a third of the money invested in U.S. mutual funds and exchange-traded funds tracks an index. The biggest money managers in the world, such as BlackRock Inc. and State Street Corp., are best known for their low-cost index funds. And the entire fund industry has been forced to lower fees in response, saving investors billions of dollars. There is literally no part of the industry that hasn’t been affected by Bogle’s revolution. 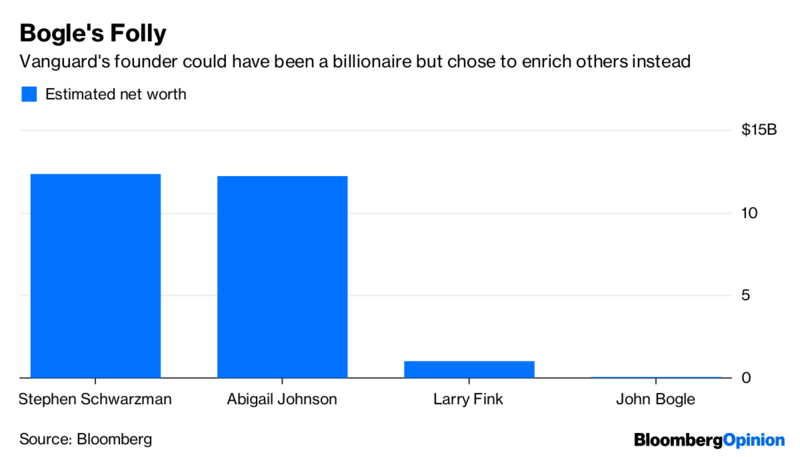 And yet Bogle’s net worth is estimated at $80 million, a laughably small sum for the founder of one of the world’s biggest financial institutions. Compare that with Stephen Schwarzman, co-founder of private equity firm Blackstone Group, who has a net worth of $12.3 billion, according to the Bloomberg Billionaires Index. Or Abigail Johnson, CEO of Fidelity Investments, who has a net worth of $12.2 billion, despite the fact that Fidelity is half the size of Vanguard based on assets under management. Or Larry Fink, CEO of BlackRock, who reportedly joined the ranks of billionaires last year. So where did Bogle’s money go? It went to Vanguard’s investors, who still pay a fraction of the fees charged by the average mutual fund four decades after the firm’s founding. It also went to Vanguard’s employees, who were undoubtedly better paid than they would have been if Bogle were intent on amassing a fortune. Some will argue that companies are required to make as much money as possible for shareholders, whereas Vanguard, which is owned by its investors, doesn’t have the same burden. That’s a cop-out. For one, any company can choose to mimic Vanguard’s ownership structure. Also, a growing number of business leaders are big shareholders in their companies, so the corporate structure gives them a backdoor through which they can pad their own pockets. Bogle’s spread-the-wealth philosophy is laid out in his remarkable 2008 book “Enough: True Measures of Money, Business, and Life.” In it he extolls the virtue of giving and expresses deep skepticism about ceaseless accumulation of wealth. It’s hard to imagine many other business leaders expressing those sentiments, never mind living by them, but Bogle’s example is needed more now than ever. The disparity between business leaders and workers is shocking. Jeff Bezos, the founder of Amazon.com Inc., is the world’s richest person with a net worth of $139 billion. Meanwhile, the median annual compensation at Amazon was $28,446 in 2017, according to the company. That’s below the 2018 federal poverty level for a family of five. There are numerous other examples. Jim and Rob Walton, heirs to the Walmart Inc. empire, are collectively worth $91 billion. The median annual compensation for a Walmart worker in the 2018 fiscal year was $19,177, which is below the poverty line for a family of three.